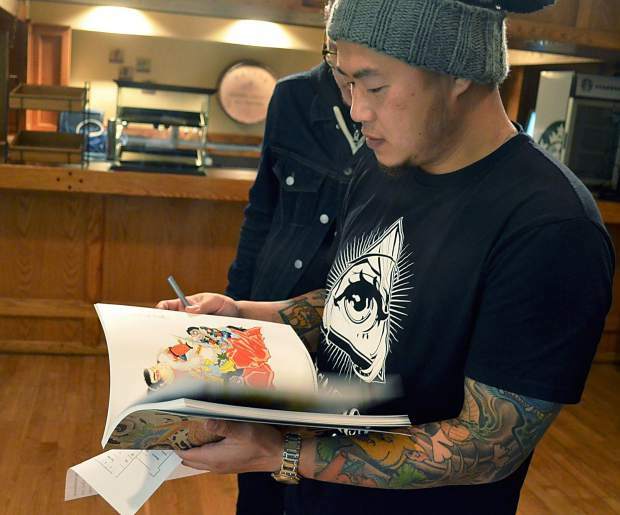 Keith Lin, of Kingsland Ink in Auckland, New Zealand, flips through a publication from Gomineko Books at the Village at Breckenridge prior to the Summit Tattoo Invitational. More than 100 tattoo artists from all over the world will converge on Breckenridge this weekend for the inaugural Summit Tattoo Invitational, a symposium celebrating tattoo culture. The convention begins at noon Thursday, March 19, and runs through Sunday, March 22, with artists spread out among the conference rooms on the first floor of the Village at Breckenridge, located at the base of Peak 9 on South Park Avenue. Maps will direct visitors through the maze of booths, where tattooers will be on hand to discuss their artwork and ink longtime clients, as well as walk-up customers, who can arrange sessions on the fly while space is available. “It’s open to the public, and people are getting tattooed,” said Crystal Morey, organizer of the conference. “It’s an event that they can interact with; it’s not just an exposé. Everybody can come in and get tattooed or watch while other people get tattooed. Morey is the head of Gomineko Books, a Tokyo-based boutique bookstore that sells and produces an assortment of Japanese tattoo art and design books. Originally from Texas, she has been in the tattoo industry for about 15 years and has helped organize similar conventions all over the world. Starting with the Gomineko Crew — a group of Japanese tattooers who specialize in a style of tattooing called tebori, or hand poking — Morey then began building a talent pool for the invitational that included artists from all over the United States and beyond, from Japan and Australia to Scotland, Switzerland and Spain. One of the first friends to sign on was William Thidemann, owner and artist at Mammoth American Tattoo in Denver. Thidemann has been helping spread the word about the event for the past year, recruiting other tattooers to the mountains. Morey said planting the Summit Tattoo Invitational in Breckenridge takes advantage of the spring break crowds and allows some of the international artists to see more of the country than just the coasts and large cities. Thidemann said the heavy percentage of artists from Colorado, especially Denver and the Front Range, allows for a chance to show off the state’s talent. Piotr Kopytek, co-owner and tattooer at Blue Heron Tattoo in Frisco, just opened his shop in October, so he’ll also be using the Summit Tattoo Invitational as a chance to promote his new venture and get some face time with potential customers. The three artists from Blue Heron will split their time between the shop and the convention, and Kopytek said he has a couple of local clients he’ll be inking at the event. Education is a large component of the symposium, which includes seminars ranging from an industry-only workshop on machine tuning to a presentation on Japanese symbolism and iconography and a chance to grill a couple of well known tattoo artists on their craft. The invitational also offers a chance for tattooers to show how tattoos have progressed in the past few decades, promoting tattoo as an art form and lifting from it whatever social stigma it might have carried in the past. Lin and many other tattooers taking part in the event are also eager for the chance to be tattooed by some of their favorite artists, knowing that each tattoo has the potential to be a one-of-a-kind work indelibly affixed to your skin to admire for a lifetime. “It’s like being able to go out and see a Renaissance painter and have that person make something unique that you can keep for your whole life,” Lin said.